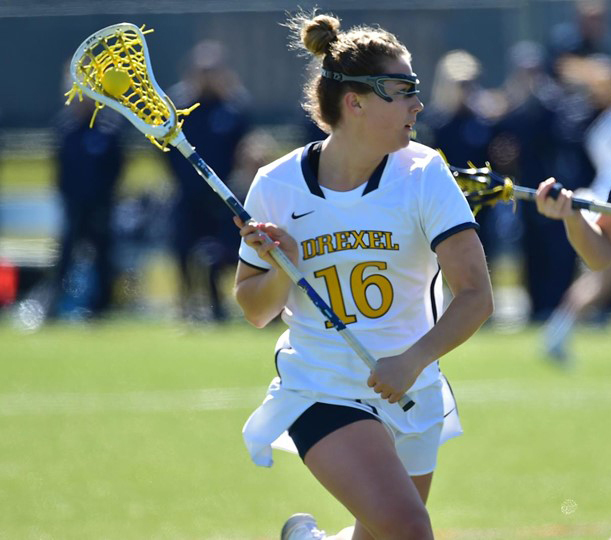 The Drexel University women’s lacrosse team played one of their most important games this season April 27 against the University of Delaware for a chance to qualify for the Colonial Athletic Association championships. After Delaware had a solid lead heading into halftime, the Dragons tried to make a comeback in the second half, but unfortunately came out just shy of a championship opportunity. The game began with junior Maggie Stetson winning the opening draw control for the Dragons. After a Drexel turnover about a minute into play, Delaware gained control of the ball and took a shot. Freshman goalkeeper Zoe Bennett got the save for the Dragons. Two and a half minutes into play, freshman Colleen Grady took a shot against Delaware, but their goalkeeper also made the save. The first goal of the game came 15 seconds later when Stetson scored off of a free position shot. Three minutes later, Delaware tied the game 1-1. Two more goals from Delaware put them up 3-1, but the Dragons were able to respond with 16:35 left in the first half. Freshman Karson Harris got a shot past the Delaware goalkeeper assisted by Stetson for her 28th goal of the season. Unfortunately, this was the last goal the Dragons would make in the first half as Delaware had a 4-0 run. Heading into the second half, Delaware was leading 7-2. The first six minutes of play were a battle between both teams to see who would score first. With 23:23 to play in the game, sophomore Lucy Schneidereith grabbed a goal for the Dragons assisted by junior Cassidy Delaney. Harris won the draw control, and the Dragons moved the ball around Delaware defenders to find Lucy Schneidereith who passed to sophomore Courtney Dietzel for Dietzel’s only goal of the game. At this point, the Dragons were within three goals. It wasn’t until 20:26 that Delaware was able to get a shot past Bennett to bring the score to 8-4. Grady found the net with 18:59 to play to start a 3-0 scoring run for the Dragons. Just under a minute and a half later, Stetson scored two goals both assisted by Harris only 10 seconds apart to bring the Dragons within one goal, 8-7. Not ready to give up the lead, Delaware got another goal with 10:09 to play. Delaney got a shot past the goalkeeper assisted by Stetson to bring the Dragons again within striking range of a tie game, 9-8. It wasn’t enough to come back as this was the Dragons’ last goal of the game and the season. Delaware sealed the deal with 51 seconds left with another goal for the final score of 10-8. Stetson finished the game with a hat trick and two assists. Bennett ended with 11 saves for the Dragons. This was a tough game to end the season for the Dragons who will be losing seniors Molly Savage and Alex Beilman. Beilman finished this season with a total of 11 goals, five of which were scored in CAA play. Grady finished the season as the leading scorer for the Dragons with 32 goals and 24 assists. Harris followed behind her with 28 goals and 11 assists. Schneidereith had 24 goals and six assists, and Delaney had 18 goals and 11 assists. Dietzel finished with 16 goals this season, 12 of which were scored in CAA play. Bennett had 147 saves for the season. The Dragons finished with a record of 4-12 and 1-5 in the CAA. As they look ahead to the 2018-19 season, many players will be returning to the team and bringing experiences from this season. Hopefully next year we will see the Dragons in the CAA championships representing Drexel University.